Guggenberger, Veit. Ayd-Buch: warinnen findig das ayd, und ayd-schwur seyen… [Oath-book: wherein is found the oath and how to swear it…]. Munich: Druckts und verlegts Heinrich Theodor von Cöllen, Churfürstl. Hof-Buchdrucker und Buchhandler, 1738. 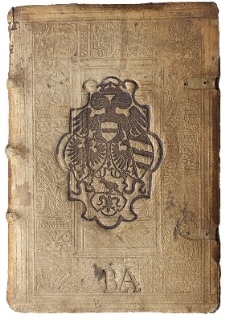 This book is the second edition of a 1699 treatise on the oaths used in different trades, and the relevant laws of the Holy Roman Empire and German states. The text addresses the oaths of apothecaries, doctors, bakers, architects, millers, and grave-diggers. The book contains two engravings showing the proper postures for oath taking. The text is printed in black ink on handmade paper and sewn on single raised cords. 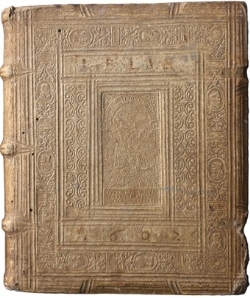 The book has wooden boards, is covered in alum-tawed skin decorated with blind-tooled stamps and rolls, and retains its original clasps. 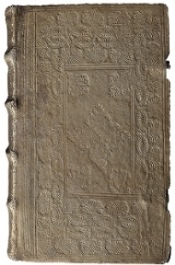 We found a book with a similar decorative program in the Bibliotheque Sainte-Genevieve database of rubbings. That item was bound not in alum-tawed skin but in brown calf leather. 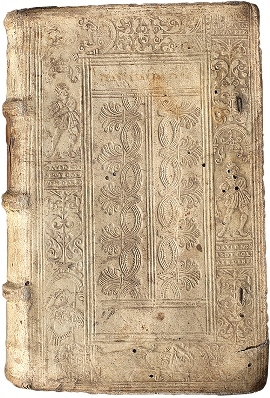 The text it contains are the works of 5th-century Christian theologian Marcus Eremita, and the work of Saint Opatus against the Donatists, published in Paris in 1563 and bound in Germany.